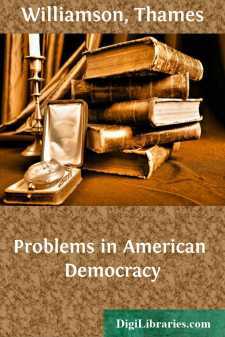 There is an increasing demand for a textbook which will bring the student into direct contact with the great current issues of American life, and which will afford practical training to those who soon must grapple with the economic, social, and political problems of our own time. It is with the hope of meeting such a demand that this text has been prepared. The plan of the book calls for a word of explanation. It is poor pedagogy to expect the student to attack the defects of American life, and at the same time to place in his hands a book which deals predominantly with the mechanism of government. As well send a boy to a hardware store to buy tools before he is told whether he is to make a mouse-trap or a boat. Furthermore, to spend much more time on the mechanism of government than on the actual problems of democracy is a mistake in emphasis. Government is a means, not an end. It is a tool by means of which we attack and solve our problems. Therefore the student of this text begins, not with the mechanism of government, but with the historical background of American democracy, its origin, development, and promise for the future. Following this is a brief survey of the economic life of the nation, because that economic life constitutes the fundamental basis of our problems. Considerable space has been devoted to a problem growing directly out of economic conditions, i.e. the question of social justice or industrial reform. This is the most pressing question before any modern people, but strangely enough one which heretofore has been neglected by our schools. Because they tend to arise primarily from a bad economic situation, such social problems as industrial relations, health in industry, and immigration are next considered. From social problems the text passes to the economic and social functions of government, and thence to the question of making government effective. The mechanism of government has been placed last, and for the reason already given, i.e. because a knowledge of the framework of government is valuable only after the citizen knows something of the needs which that mechanism must be made to fill.